In the build up to World Mental Health Day, we thought it could be useful to draw together a set of resources / links that our families could access. This is an issue that not only affects our children and young people, but also ourselves as carers due to the additional stresses of our caring responsibilities. This email works better if you display the images – we’ve tried to put web links against all of these to take you to their web page. 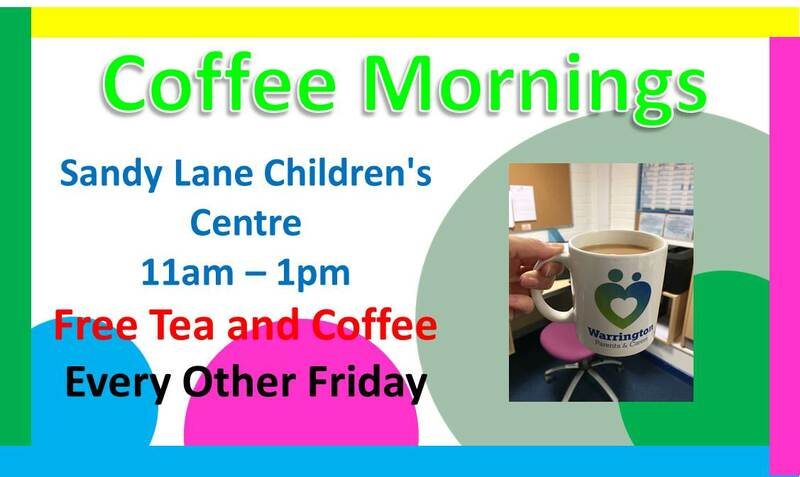 We’ve tried our best to find as much useful information to share with our families – if you’d like to chat about these, or any other issues affecting our families, then come along and join us at our coffee morning. Happy? OK? Sad? is Warrington’s mental health awareness website. The site includes information about how to look after your mental wellbeing, as well as a directory of mental health support services. There’s also details of services you can contact if you can’t cope and need help right now. Local services are clearly marked and there’s a short description explaining what each service offers. The website is divided into age specific pages, so you can quickly find the information and services most relevant to you. There’s also a page for frontline workers with links to free resources and online tools. Whether you’re feeling great and want to stay that way, you’re a bit fed up; or you’re struggling to manage your feelings, this site has links to information and tips ranging from how to boost your mood, to where to get help if you’re unable to cope. Check it out on the link below. Buddy Up is a befriending project which supports children and young people with disabilities; who are at risk of becoming socially isolated. Each young person referred to Buddy Up, is supported by a volunteer ‘Buddy’ within a social setting, allowing the young person to interact with their peers, and gain greater social and independence skills. 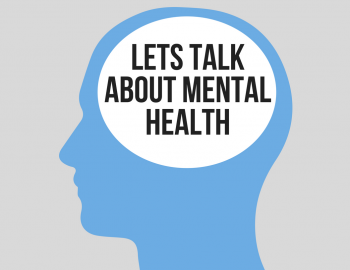 Child and Adolescent Mental Health Services – also known as CAMHS – support children and young people up to age 18 with their emotional and mental health and wellbeing.When we talk about your mental health, we mean how you feel and how you cope with the things going on in your life. This could be connected to anything from school, your friends or even your family life. If you feel you aren’t coping too well with the ups and downs of life, it may be that you need some support to help you manage them better.If you do need help, CAMHS will work together with you and your family to decide what support you need to have good mental health and wellbeing. 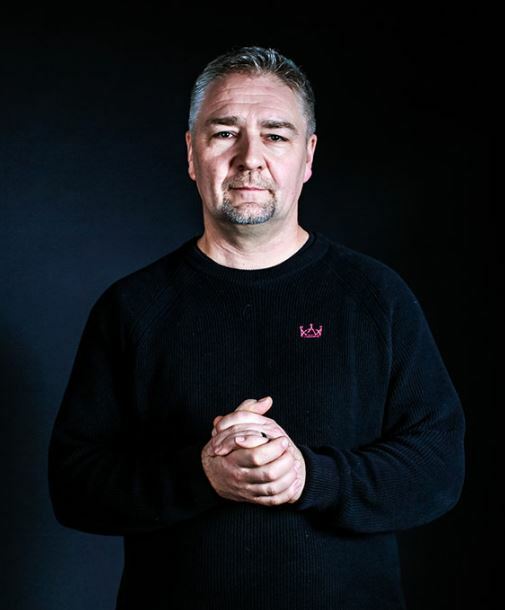 Their aim is to help young people get the support they need to tackle any problems early on before they get worse, and to act quickly if they do. If you have any concerns about your mental health and wellbeing, you can come along to our weekly Mind Works drop-in cafés so you can speak to a mental health professional about any concerns you have. No matter how big or small, our staff will talk to you and ask questions about your difficulties, then offer advice and signpost you to other local services that can help if needed. If you have any questions you can call CAMHS directly on 01925 575 904. Your parents or carers can also call us too if they’d like to speak to someone. We also accept referrals from other health professionals who may be working with you, such as your GP, health visitor, school nurse or social worker. If you are a health professional and would like to make a referral for one of your patients, visit the health professionals section of our website to download the referral form. 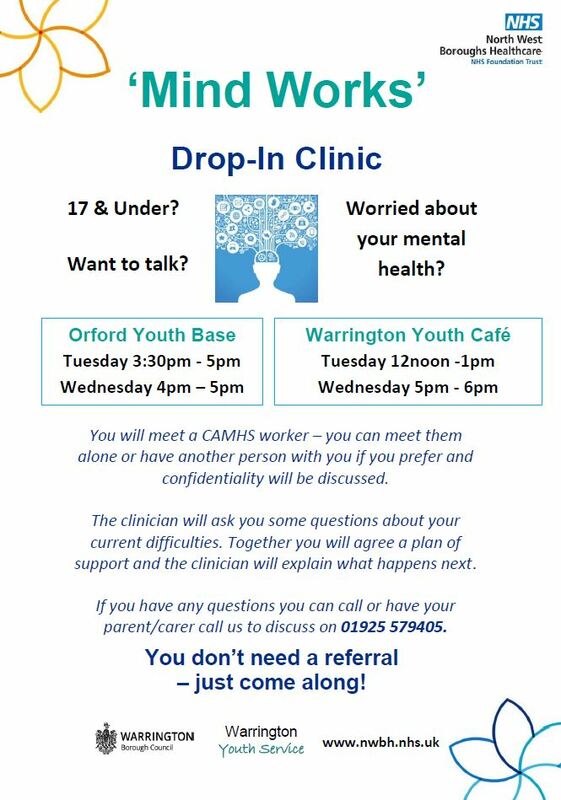 Weekly drop-ins at various venues accross Warrington. Providing respite from their caring role with an opportunity to meet other Young Carers, access peer support, make friends, try a new activity and have fun! 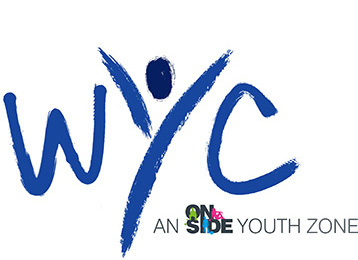 Wired Young Carers service advertise all news and events in a quarterly newsletter and events calendar. Phone: 01925 633 492 Email: wycadmin@wired.me.uk For more information see website link below. Using Mindfulness and Meditation, I can help you to connect to your unconscious mind, and liberate the healing power of your mind and body. 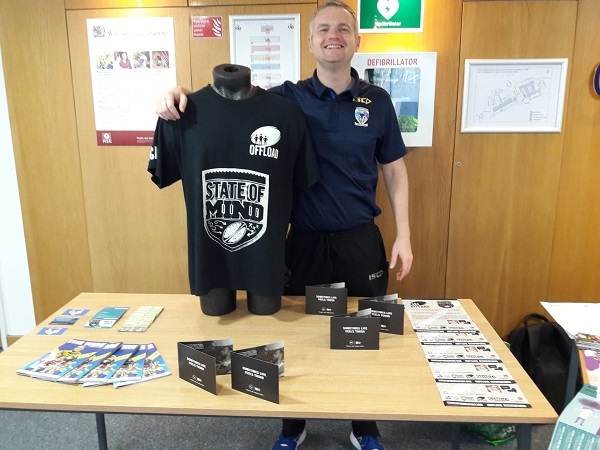 Russell runs a new family mindfulness session every week in conjunction with Warrington Wolves Foundation, come and learn Mindfulness every Thursday at The Warrington Wolves stadium for just £3 per week. All welcome, children under 16 free. This is a drop in session so you can just turn up at reception before 5.30pm when the session will begin. For more details follow the website link below. Warrington Parents and Carers have our own Facebook group dedicated to our dads.Our Dads Matter! 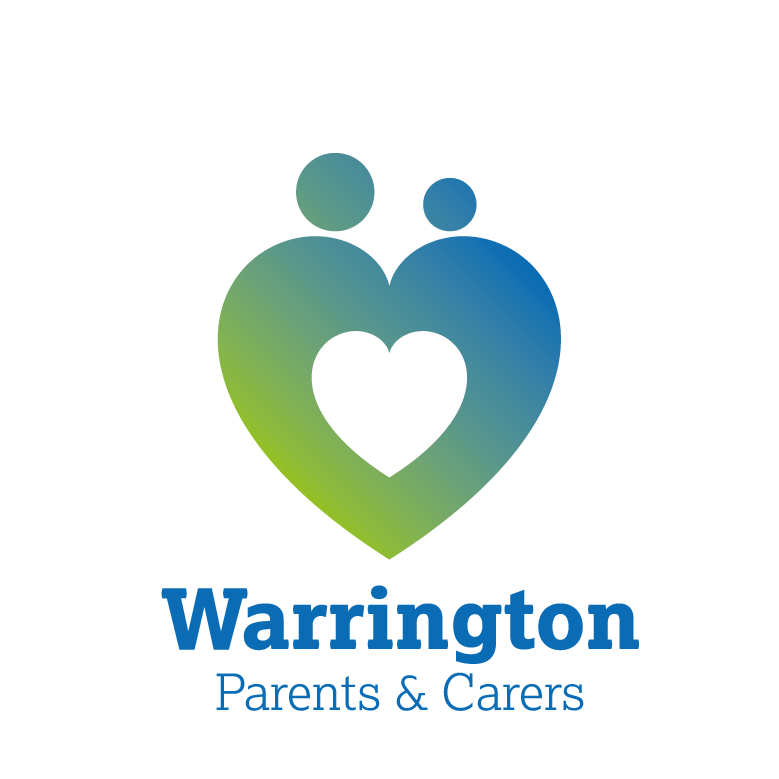 A group set up specifically for Dads and Carers of children with disabilities and additional needs in Warrington. The group offers an opportunity for Dads to talk to like minded mates and share the challenges they face. Warrington Primary Care Psychological Service is a service to help you when support is needed. We can work with you to help you examine how you are coping and develop your coping skills. All staff have received special training to offer support through a stepped model of integrated care. – Guided self-help which focuses on empowering people to make changes at a pace that suits you. – Cognitive Behavioural Therapy (CBT) is a talking treatment that looks at how thoughts affect emotions whilst helping you to identify goals. – Signposting to put you in contact with other services that can offer you help and support. – Counselling to help address difficult life events and problems you may experience in relationships (provided by a partnership service). Our service offers a range of interventions to people who are 16 years and above, and who are experiencing difficulties.